Black Country, Bramblecrest, Europa, Inside Out, La Hacienda, Leisure Grow and many more. 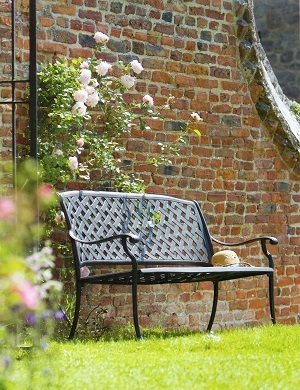 We stock a wonderful wide choice of items for your garden, which we have specifically selected for their quality. Our range of garden furniture includes high quality, maintenance free, elegant aluminium tables, chairs and benches, in a variety of sizes, shapes and colours. Our FSC wooden furniture includes benches, to enhance a special area in your garden, to a table that will seat up to 10 people and become the centrepiece of your garden. Our woven range offers the authentic natural look and feel, but is easy to clean and maintain. We also have a large range of umbrellas and parasols, available in several sizes and colours, together with parasol bases and covers. There are also heavy-duty furniture covers available for all the sets, to ensure that your furniture is protected through winter. 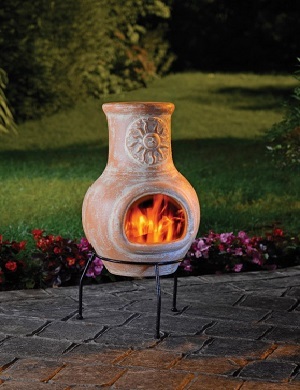 Our cast iron chimeneas are heavyweight and sturdy. Most are available with a BBQ grill, so why not gather friends and family to sit around a roaring fire and keep warm, as twilight lingers and dusk settles around you. We also stock a range of stainless steel toasting forks, so you can toast marshmallows or crumpets over the glowing embers. Made of durable steel, our braziers will create warmth on an autumn evening and keep summer BBQ’s going long into the night. As most have facilities to BBQ, they are perfect for intimate al fresco cooking and a centrepiece for everyone to gather around. There is something very special about sitting outside around a fire, on a late summer evening with family and friends. Our fire pits give a full 360-degree view of the fire. They emanate both light and warmth, allowing users to soak up the heat and gaze into the dancing flames. With the addition of a BBQ grill, this can quickly turn into an impromptu meal. Bird nest and bug boxes along with birdbaths are a must for people who like their garden and we stock a large range, as different birds and bugs require different types of boxes. Terrariums can be used inside or outside, so whether you just have a windowsill or a garden they are a must. To compliment our extensive range of sundials, which are available in slate, brass, verdi or chrome, we also stock several different sizes and shapes of plinths, for them to go on. Alternatively, for the larger garden, we have amillaries, which can serve as a feature, that tells the time, or simply make a wonderful present. Also available is our extensive selection of indoor & outdoor clocks, thermometers, weathervanes, letterboxes, hammocks, garden features, boot removers & scrapers, outdoor lanterns, reproduction Victorian cast iron lampposts in several sizes and designs, plus much, much more. We always have on display a range of cast metal animals. They include deers, cranes, sandpipers and peacocks. These gorgeous animals will give your garden that extra special something. They come in several sizes, ranging from 30cm up to 123cm tall and in two finishes, bronze or verdi. We stock a wide range of varying designs and sizes of decorative wooden model boats. These make a wonderful gift and will become a centrepiece in any room, especially on a mantle of windowsill.